So far, 2015 has been an awful year for those who love science fiction and fantasy. First, Leonard Nimoy died; now Terry Pratchett (or Sir Terry, OBE) has passed on. 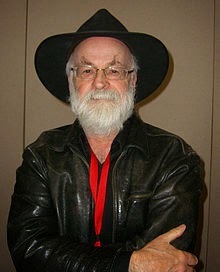 Pratchett, for those few who don't know, is an author of fantasy and science fiction, and the creator of the Discworld novels. 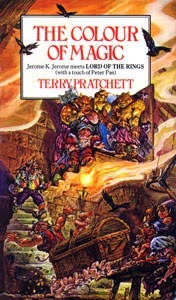 A series of dementedly sardonic books spanning more than three decades, Discworld is to fantasy what The Hitchhiker's Guide to the Galaxy is to science fiction: They both display a loopy, intellectual, madly philosophical love of the genre and its conventions, and a gift for following bizarre assumptions to logical and insane conclusions. Pratchett could take a gag and make it run over a dozen pages before letting it collapse in exhaustion; he never found a cliché he didn't like...to turn on its head; and he was merciless to the archetypes of sword and sorcery. He was probably the first author, for instance, to consider what would happen after Conan aged out of his "musclebound swordsman" status; and he recast Gandalf and his colleagues as squabbling Oxbridge dons. He was also, by all accounts, a gentle and gracious man. Pratchett was 66 when he died, and he knew it was coming: He had been diagnosed with a rare form of early-onset Alzheimer's disease. He considered himself fortunate that the disease affected his physical condition, while leaving his cognitive faculties relatively unscathed. This allowed him to keep working almost until the end. When he was granted a coat of arms in 2010, it contained a nod to his condition, to one of his most beloved characters, and to Blue Oyster Cult: The motto was Noli Timere Messorem. If you use a Mac - as I do - this will probably interest you. It seems that the new MacBook is less of a powerhouse laptop, and more of a tablet with a keyboard. Here are two posts, one putting a positive spin on it, and one putting a negative spin. One hopes that the MacBook Pro will still be around.